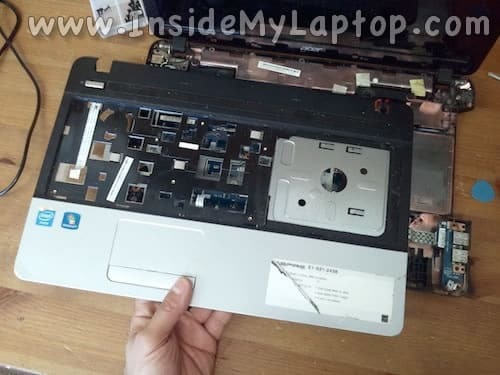 Today I will be taking apart an Acer Aspire E1-531-2438 laptop. My goal is to access and replace the cooling fan which failed and started making noise. Cleaning the fan didn’t help. 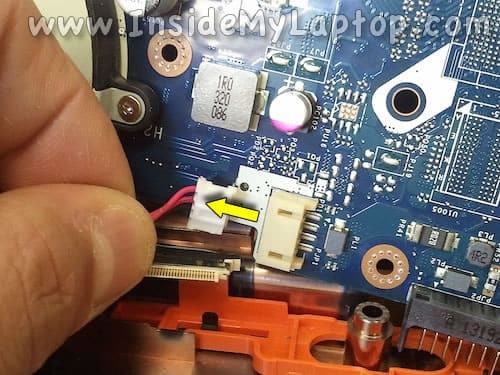 Most likely this guide will fork for other Aspire E1 series models. 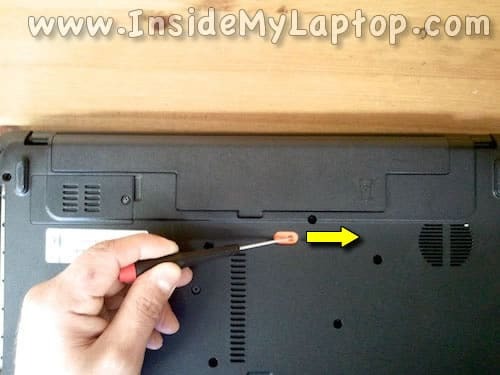 Using a small flathead screwdriver push on the latch securing the keyboard. 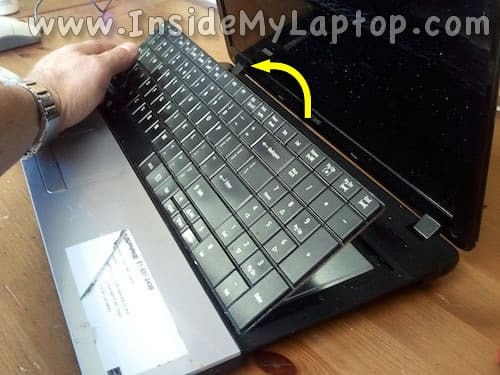 At the same time insert something under the keyboard and lift it up. 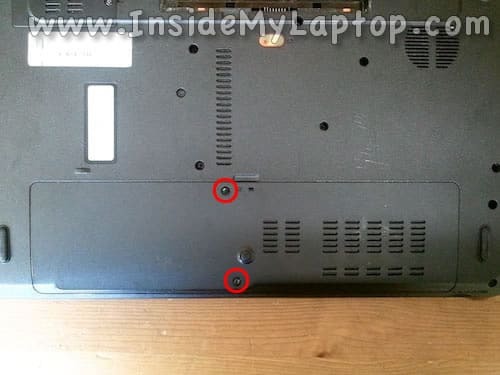 There are six latches securing the keyboard on the top. 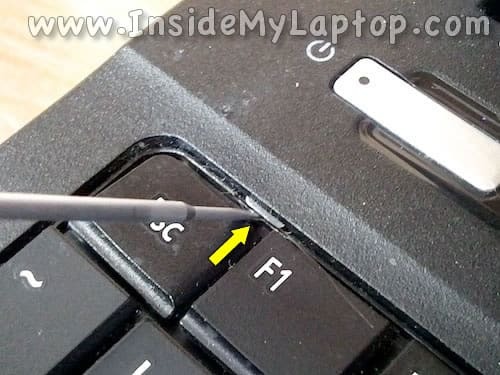 After you release all of them, you should be able to lift up the keyboard as it shown on the following picture. Now you can access and unlock the cable connector. 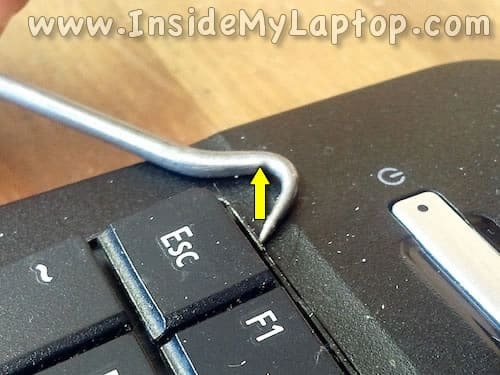 In order to unlock the connector you’ll have to slide the cable retainer about 2-3 millimeters to the shown direction. Now, after the connector is unlocked, you can pull the cable. Under the cover you’ll find the hard drive, both RAM modules and Wi-Fi card. 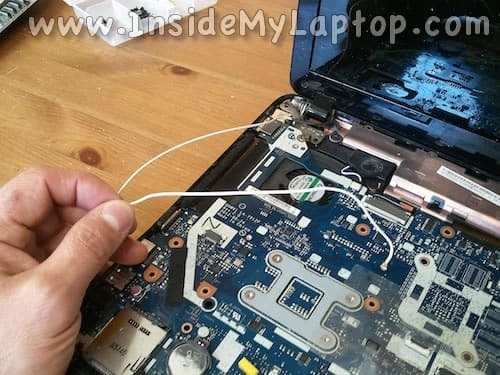 Disconnect the power button cable and touchpad cable (same technique as shown in steps 6-7). Lift up the top cover and start separating it from the bottom. I’m using a guitar pick to split the case. 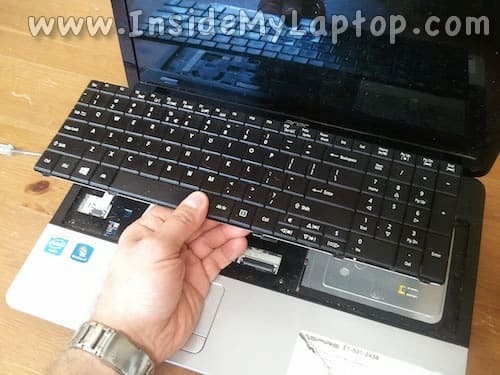 Remove the top cover (palm rest) assembly. 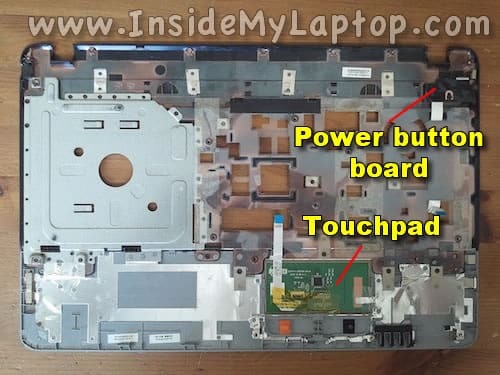 On the other side you can access the touchpad and power button board. 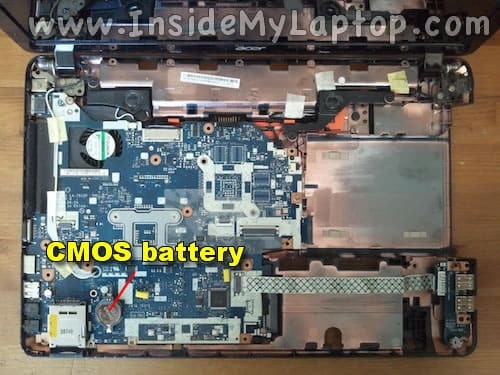 When the top cover removed you can access the CMOS battery. As you see, the cooling fan mounted under the motherboard. Let’s remove it. 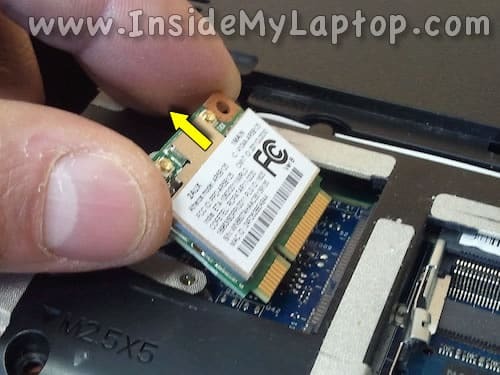 Remove one screw securing the Wi-Fi card and pull it from the slot. Un-route the white antenna cable. You can leave the black cable in place. 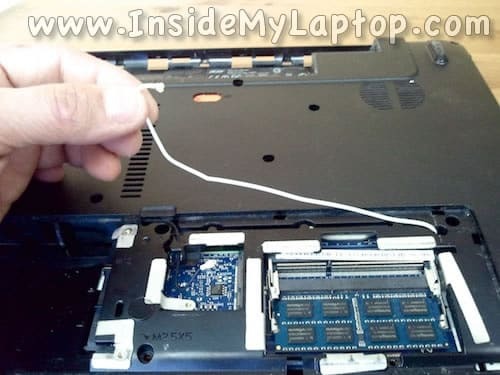 Pull the white cable though the opening and un-glue it from the motherboard. Simply unplug the male part from the female part. Do not pull by the wires. Unplug by the connector edges. 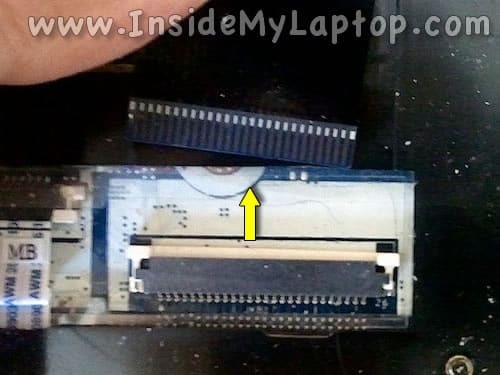 Start removing the motherboard from the case as it shown on the following picture. Be careful. The motherboard is connected to the DC jack cable. 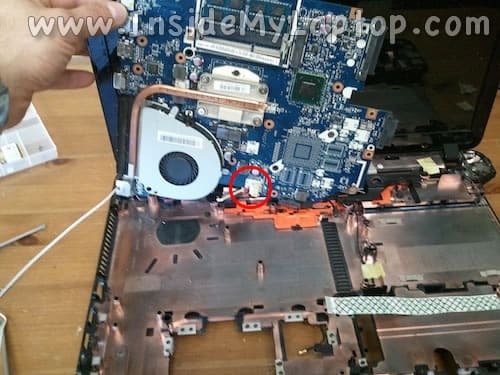 Finally, we can access the cooling fan. 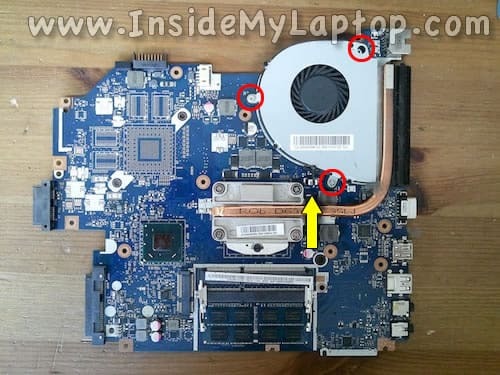 Remove three screws securing the fan and disconnect the cable. 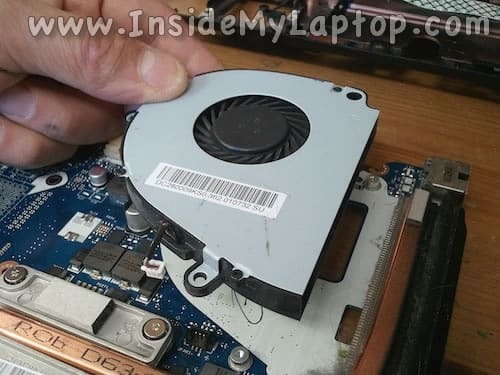 Remove the failed fan and replace it with a new one. I unable to find the fuse…. 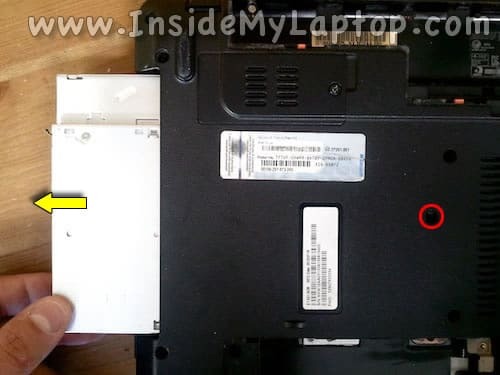 i have a COMPAQ610, that i was using and suddenly it just went OFF, and if i try to ON it ,it will only do as if it will start normally,but only the keyboard will be ON and the fan will bring a sound just for some seconds and it will stop working as well… i have check the hard drive, and the memory modules as well and yet it hasn’t work. You can try minimizing the system. 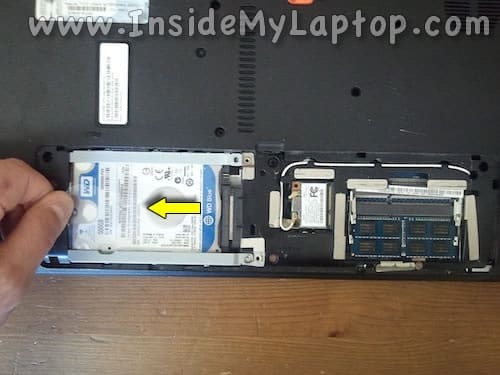 Try removing the hard drive, optical drive, wireless card, etc… maybe even disconnecting the keyboard and internal display cable. When the system is minimized try turning it on with only one RAM module in place. If you disconnected the internal LCD, you can test it with an external monitor. 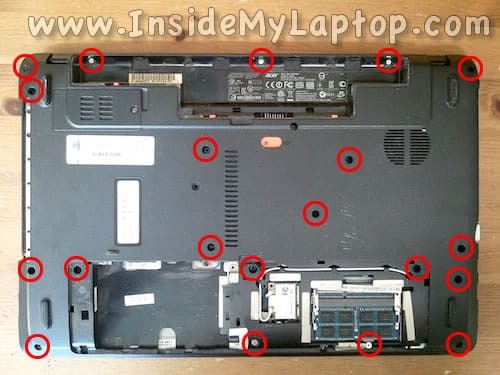 If the laptop turns on and shows the image, start adding parts one by one. 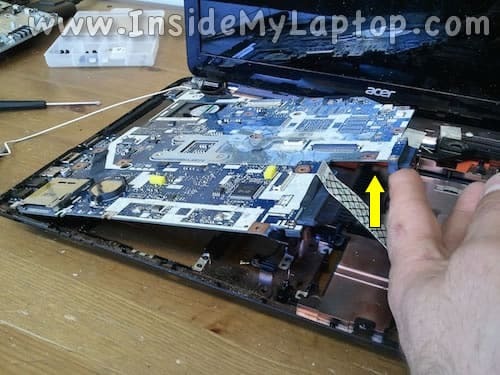 If the laptop still doesn’t turn on, probably this is motherboard related failure. 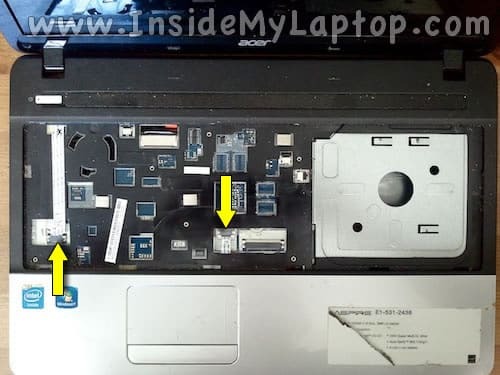 I have a problem with my Acer Aspire E1-531. After I shut it down it won’t open/power on again. After pressing the power botton to turn it on it only lights and a few seconds a click sound and it turns off. I hope you could help me on this. Thanks. After pressing the power botton to turn it on it only lights and a few seconds a click sound and it turns off. 1. Unplug the power adapter. Disconnect the battery. Wait for a minute, plug the AC adapter and try turning it on. 2. Test voltage on the AC adapter. Make sure it works. 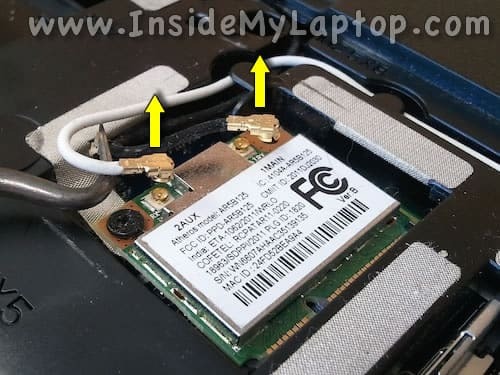 It’s possible the adapter failed and the battery doesn’t have enough charge to start the laptop. 3. Try reseating RAM sticks. Try removing RAM sticks one at a time. Thank you so much….great step by step instructions….I repaired my fan without any issues. 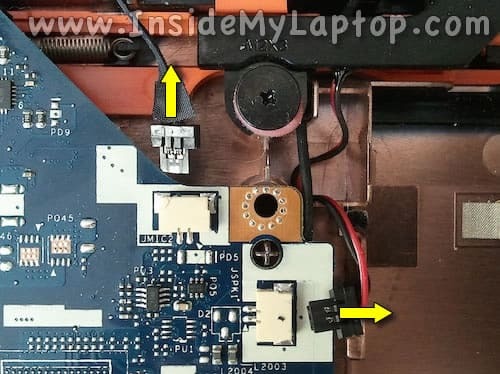 I have the Acer E1-531 and the headphone jack has failed, will this require a new motherboard or is there a way of fault finding. 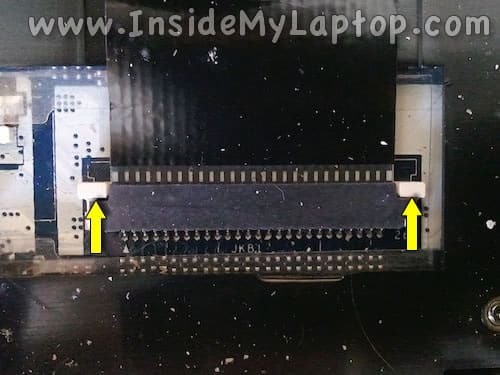 Have gone through the process described above and cannot see anything obvious wrong with the connections holding the jack to the circuit board. Probably the touchpad is bad. 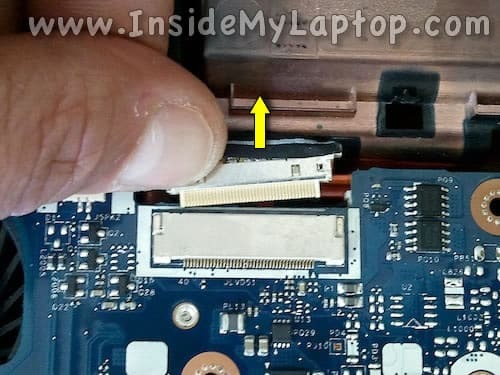 Disconnect the touchpad cable from the motherboard. 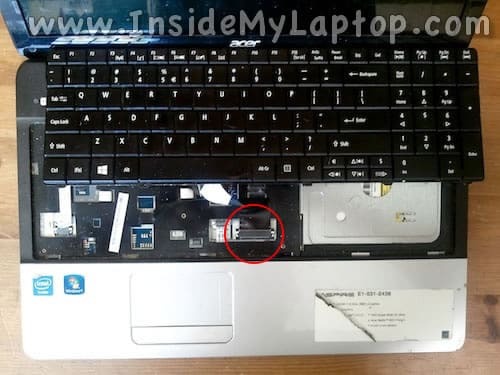 The touchpad connector located on the left side from the keyboard connector (shown in step 5). Now test the laptop with an external mouse connected. If external mouse works fine, there is a problem with the touchpad. Replace it. 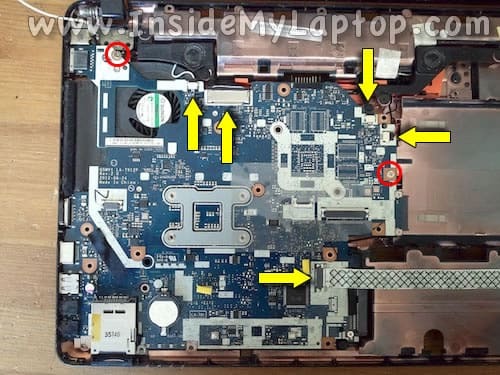 I have the Acer E1-531 and the headphone jack has failed, will this require a new motherboard or is there a way of fault finding. It depends how the jack failed. If there is a problem with the audio chipset on the motherboard, you’ll need a new motherboard. If there is a problem with the audio jack, probably it can be replaced. Here’s what you can try. Sometimes the audio jack stops working because there is dirt inside. Try inserting and removing the audio plug from your headphones/speakers into the jack a few times very quickly. Sometime it helps to clean up the contacts inside and the jack just starts working again. Can you please Email me a picture of where the BIOS and EC Chips are located on the E1-531 Motherboard, as I have to replace these chips. 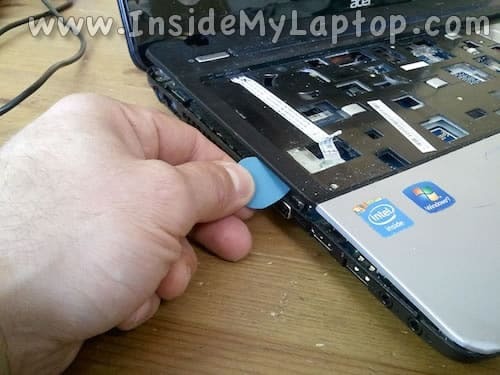 hello my brother just spilled coffee on his laptop and we have been trying to take it apart but it is touchscreen can you help? I wrote you about trouble I was having with a Gateway NE56R13U, thinking it was assembled the same as your NV57R***. Well they are not the same. This Acer and my Gateway Ne56r13U are however. 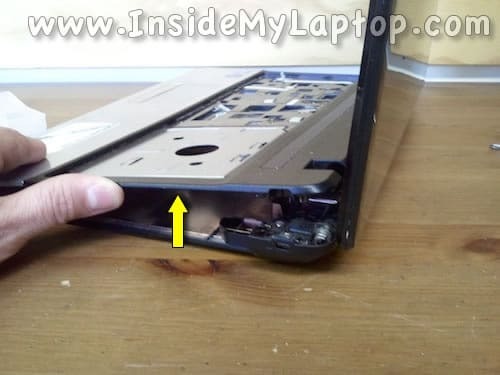 You might add this info on your website as the problem with the left hinge appears to be a manufacturing defect. The hinge is anchored in PLASTIC and all three housings are broken. I’d include a picture, but there’s no option…have a great evening! 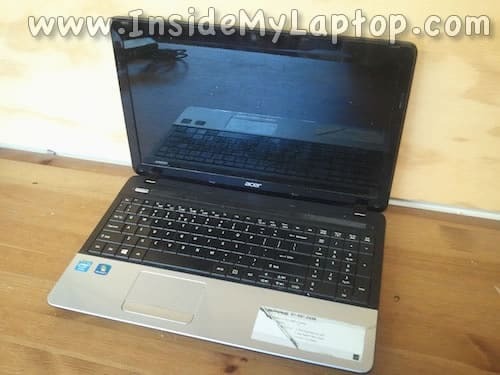 Hi sir,I have acer E1-531 series that has been perpetual giving me headaches…it just so happened one day back in 2014 that it shut down and never turned on again,until the day I discovered your site and thus follow your steps in dismantling it after a visit to a countless list of forums trying all the techniques they advocated to no success.After the success in following your procedure,I turned my laptop on and to my delight,there it was up and running like the old good days.Now the devil is back again and I followed the procedure again,but this time it was in vain…I really don’t understand what’s going on because sometimes when I shut it down,it just happen that it doesn’t turn on outright the following day,I’ll have to keep trying it for an hour or two before it could turn on,sometimes it takes days just like now,so I really,really need your help with it sir as it is the only one I have and need to use it for atleast two months before I could get to fix it or replace it with another one.Sorry for the lengthy text,I just wanted to provide you with detailed information.Thanks in advance.